Imagine how healthy you would feel every day if you were no longer taking in cigarette smoke, with all its deadly carcinogenic poisons into your body. Imagine how much younger, fitter and more attractive you would become if your body's processes were working to optimize your health and energy, rather than being damaged daily. Imagine how many extra thousands of pounds you could spend on the things you really love - things which would actually improve the quality of your life, and not undermine it. ......"Hypnosis is the most effective way of giving up smoking"
Using a unique combination of Clinical Hypnosis, Neuro-Linguistic Programming (NLP) - you can now change the way you think about smoking so that you can stop smoking in one single session FOREVER! It's pleasant and drug-free, with none of the pain and trauma usually associated with quitting, and it's now easier to quit than you ever imagined. Ok, you know that smoking is bad for your health, but did you know that every cigarette you smoke shortens your life by 14 minutes? The harsh facts are that smoking causes over 400,000deaths every year in the US, from cancers, chronic lung diseases, and coronary conditions. It may seem tough, but giving up smoking makes perfect sense. Why not regain your health, wealth, and self-esteem by making the decision to quit now? By quitting smoking, you will immediately begin to look and feel better, healthier. Twenty minutes after you quit, your blood pressure will drop and the temperature of your hands and feet will return to normal. In just 72 hours all the nicotine will leave your body completely. The bottom line of all this is that "Smoking Kills". It says so on every single packet that you smoke. And the dangers increase the longer you smoke. Scientific research study continues to confirm what we know in our hearts to be true: Cigarette smoking kills and cripples in more ways than most smokers readily care to admit. NEWS UPDATE! "Smoking is killing 1200 people in the US every day"
If you made the decision to stop smoking today, just think how many extra thousands of dollars you could spend on the things that you really love. If you are serious about quitting smoking, hypnotherapy can help. I use advanced hypnotherapy techniques that make stopping smoking simple and easy so that after a just one-hour long session, you'll leave as a happy non-smoker - not feeling deprived, or feeling you've made a sacrifice or any pain. Instead, you'll have a huge sense of relief and real inner happiness that you have at last achieved what most smokers secretly long to achieve… to be finally free from nicotine drug addiction. You will have become a happy, permanent, non-smoker. When smokers try to stop with other methods they may suffer misery, craving, and depression caused by feelings that they are being deprived of their pleasure or a crutch. The beauty of hypnosis, and the way we use advanced hypnosis, in particular, is that it completely removes any need, or even the desire to smoke. You won't require useless aids, gimmicks, or substitutes. No nicotine gum or patches. No inhalers or nasal sprays. No needles, lasers or even pills. All you have to do with hypnosis is sit back in a nice comfortable chair, and relax. It doesn't get much easier than that! How does hypnotherapy help me kick the smoking habit? The beauty of this unique approach is that I use the best of traditional hypnotherapy techniques, and combine them with the science of Neuro-Linguistic Programming (NLP), which takes hypnosis to an even greater level of effectiveness. One of the reasons why it's not painful or difficult to quit smoking with this method is that together we transfer the pleasure derived from smoking to a healthier habit of your choice (e.g. exercise, drinking more water, or relaxation). This is the reason why this way, there is NO unwanted weight gain or any other problems associated with "kicking the habit" - the only side-effects are an increase in health, wealth, and freedom. Because smoking is a habit, it is controlled by the unconscious mind. Since hypnosis and NLP work directly with the unconscious mind, this is the only method that makes sense! I can really help you effortlessly make that transition into the healthy lifestyle of a happy non-smoker - it only takes an hour to quit for good! "No matter how much you smoke...or how long you've been smoking...you can stop smoking without anxiety, irritability, cravings or weight gain"
Currently one-quarter of all adults in the US smoke. Seventy percent want to stop but find it hard to quit. It all comes down to one thing …FEAR ! All of these are just examples of one overriding fear. The one simple reason that you have not stopped smoking is that you fear it will be too painful and too difficult! Hypnosis Makes It Easy! I thrive on my referrals from happy clients and am proud that I even receive recommendations, referrals, and receive many testimonials from people who are delighted and amazed to have become non-smokers so easily and painlessly. A few of their testimonials appear on this site. Who do you know who wants to stop smoking? Know a friend, relative or colleague who really wants to stop smoking? Someone who has even tried to stop before? Or perhaps someone you want to stop with? "Smoking kills almost six times as many people as road and other accidents, suicide, murder, manslaughter, poisoning, overdoses and HIV all put together!" US studies show that smokers in their 30s and 40s are five times more likely to have a heart attack than non-smokers. Tobacco contributes to the hardening of the arteries, which can then become blocked and starve the heart of blood-flow, causing the attack. Often, smokers who develop this will require complex and risky heart bypass surgery. If you smoke for a lifetime, there is a 50% chance that your eventual death will be smoking-related - half of all these deaths will be in middle age. Smoking also increases the risk of having a stroke. Another primary health risk associated with smoking is lung cancer, which kills more than 20,000 people in the US every year. 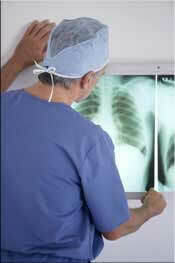 Lung cancer is difficult cancer to treat - long term survival rates are poor. Smoking also increases the risk of oral, uterine, liver, kidney, bladder, stomach, and cervical cancers, and leukemia. 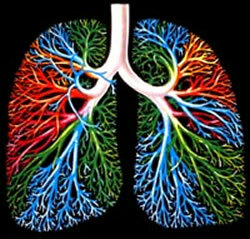 The lung damage which causes emphysema is irreversible and makes it extremely difficult to breathe. Smoking in pregnancy greatly increases the risk of miscarriage, is associated with lower birth weight babies, and inhibited child development. Smoking by parents following the birth is linked to sudden infant death syndrome, or cot death, and higher rates of infant respiratory illness, such as bronchitis, colds, and pneumonia. By 2020, the World Health Organization expects the worldwide death toll to reach 10 million, causing 17.7% of all deaths in developed countries. There are believed to be 1.1 billion smokers in the world, 800,000 of them in developing countries. In mechanical terms, our lungs can be described as the site of gas exchange: Oxygen--the fuel all the cells and organs of our body need to function--is extracted there from the air we inhale and infused into the bloodstream, to be distributed to other organs and tissues. With each exhalation, we dispose of the carbon dioxide that is the by-product of our bodily processes. In our lungs, in the course of a single day, an astonishing 8,000 to 9,000 liters of breathed-in air meet 8,000 to 10,000 liters of blood pumped in by the heart through the pulmonary artery. The lungs relieve the blood of its burden of waste and return a refreshed, oxygen-rich stream of blood to the heart through the pulmonary vein. Below is a thumbnail of a healthy lung and two thumbnails of diseased lungs. Smoking is responsible for almost 90% of lung cancers amongst men, and more than 70% amongst women. Worse, when you get lung cancer, you're very likely to die from lung cancer. It's 92% fatal among men, and 88% fatal among women. Smokers are 10 times more likely to die from lung cancer than a non-smoker. If you've smoked since a teenager, the lung cancer rate zooms to nineteen times higher. And men who smoke more than a pack a day have about 20 times the lung cancer rate of non-smokers. Cigarette smokers also run a much higher risk of being struck by many forms of cancer, including cancer of the mouth, larynx, and esophagus. Cigarette smoking is also associated with higher rates of cancer of the urinary bladder and kidney. Emphysema is one of the several chronic obstructive pulmonary diseases. It causes abnormal swelling and destruction of lung tissue. Lungs maimed by emphysema eventually lose their elasticity. Breathing becomes a continuous agonizing struggle. And there's little hope for a significant recovery once diagnosed. Lung tissue once destroyed by emphysema can never be replaced, turning its victims into respiratory cripples, who spend agonizing years gasping for breath. Cigarette smoking is also associated with higher rates of peptic ulcers, stomach disorders, and periodontal disease. from 5 to 15 years after quitting, stroke risk is reduced to that of people who have never smoked. Denial is a defensive coping mechanism for not facing up to the reality of nicotine drug addiction. There are over 40 chemicals found in cigarette smoke that are known carcinogens - that's 40 good reasons to give up smoking now! Tobacco smoke is more dangerous to health than nicotine. Long-term inhalation of tobacco smoke exposes every cell of your body to powerful chemicals that can cause cancer and cell mutations, and that ultimately cause tobacco-related illnesses. Tobacco smoke from cigarettes, cigars, and pipes contains over 4,000 chemical compounds and breathable, suspended particles. Some of the chemicals present in tobacco smoke have been proven to cause cancer and increase the risk of birth defects. These include ammonia, arsenic, benzene, cadmium, carbon monoxide, formaldehyde, lead, mercury, naphthalene, urethane and a variety of nitrosamines (potent human carcinogens). Formaldehyde, ammonia, urethane, and naphthalene are contained in household products with labels telling you to avoid inhaling them. There are also radioactive chemicals in tobacco smoke, like polonium-210. So far, over 40 chemicals have been found in tobacco smoke that are known human carcinogens. This means that these chemicals have been proven to cause cancer not only in laboratory animals but also in people.